The Citterio E product line brings the thought of the Pythagorean School of Philosophy to life that beauty comes from the opposite. Round and square, traditional and new, classic and modern meet in the faucets, creating a timeless elegance. Overall, Citterio E is a further development of the Citterio line, but with slightly more filigree shapes and rounded edges. And there are other small differences to Citterio: in Citterio the rosettes next to the handles "Hot" and "Cold" stand for hot and cold water, in Citterio E this is more discreetly marked with a red and a blue line. 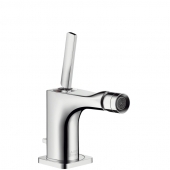 The Citterio E series offers a wide range of washbasin taps. 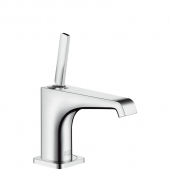 These include the faucets in the single-hole free-standing version in various heights: 200 mm, 236 mm, 299 mm and 362 (each measured with the lever pointing upwards). 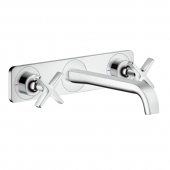 The faucets with the standard lever are then slightly larger in all versions. 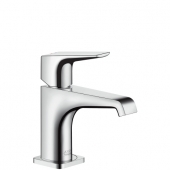 The range also includes a three-hole stand version with or without rosette for stand mounting and two- and three-holes faucets with and without rosette for wall mounting. 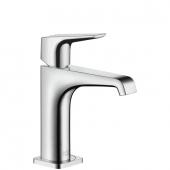 The outer contours of the washbasin faucets are very distinctive, but somewhat more rounded on the inside. 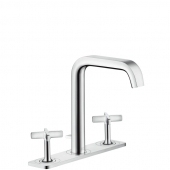 Overall, the faucets appear to be more sophisticated and have more curves than Citterio. The cross handles are also finer. Nevertheless, the angular basic form is taken up for example in the base plate and in the rosette, but also with rounded corners. 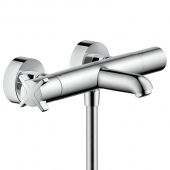 The Citterio E shower faucets have an outstanding design: the shower rails have two parallel rods connected with cross struts. 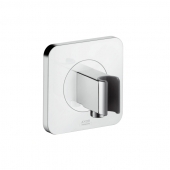 One is attached directly to the wall, the other serves as a mounting bar for the shower holder and the hand shower. 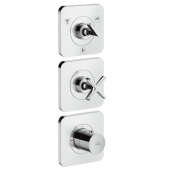 The bar can be purchased individually or as a set with a hand shower. In addition, the product line also includes a shower pipe with a rod. 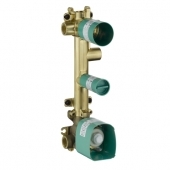 This offers a complete shower equipment with inclinable three-jet head shower, hand shower, shower hose, thermostat and rod that enables an immediate bath shower. 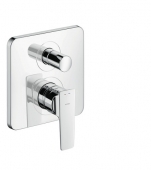 Citterio E also offers matching utensils for an individual combination of individual elements: individual thermostat modules and matching base bodies, shut-off and diverter valves for two or three spray units and side showers that can also be used as head or neck showers. These have a size of 120 mm and the jet angle is adjustable in five steps. 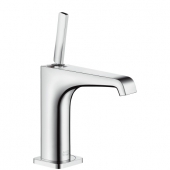 A highlight in any bathroom with a free-standing bathtub is always the free-standing bath mixer. This has a thermostat, a bath inlet, a hand shower with two types of jets and a shower hose. The filigree and elegant cross handles are attached to the right and left. 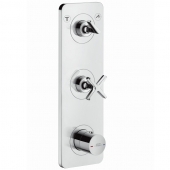 The switchover between bathtub and shower is operated by a push button and the faucet has a safety lock to protect against scalding. 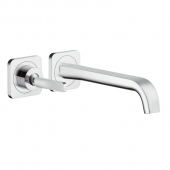 The free-standing bath mixer also combines a round base body with distinctive edges and rounded elements. 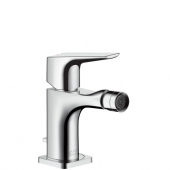 In addition, the Citterio E series includes a bath thermostat for wall mounting, a single inlet (projection 180 mm) and individual single-lever mixers for the personal composition of your bath faucet. 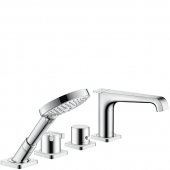 The range is completed by the elegant multi-hole faucets: two- and four-hole bath rim or tile edge faucets with three jet types shower and inlet and a two-hole faucet for two consumers without bath inlet. 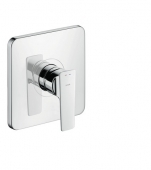 The Citterio E bidet faucet is available in two versions: with the joystick lever upwards or with a classic lever pointing forwards like a tap. The form and the basic shape widens towards the front - angular at the back, round at the front - gives the bidet faucet an outstanding design.